TEN is deploying wireless data networks to cover the oil and gas producing regions of the Permian Basin and Eagle Ford Shale, using the latest available fourth-generation Long-Term Evolution ("4G LTE") communications technology over exclusively licensed 700 MHz and AWS spectrum. The Company's network will provide oilfield communications capabilities that are faster and more reliable than existing satellite and private radio network solutions at substantially lower prices. The implementation of this network will finally enable the energy industry to fully and cost-effectively realize the long-anticipated efficiencies in centralized monitoring, reporting, troubleshooting and mobile communications offered by the "Digital Oilfield." TEN's service will replace existing technologies and, due to its attractive price point, greatly expand the addressable market. Applications include remote drilling data collection and analysis, real-time reporting of well production and equipment performance, centralized expert analysis and troubleshooting, mobile connectivity for field operations, including oilfield services providers, site access control and security monitoring, and voice over Internet Protocol ("VoIP") and video conferencing applications. 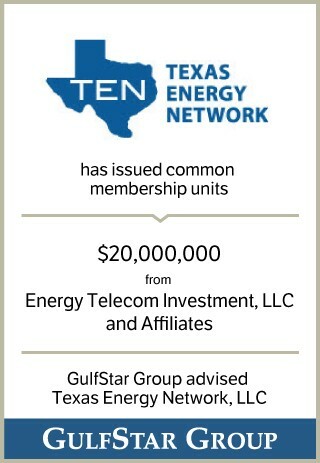 Founded in 2010 by telecommunication industry veterans, TEN commenced initial network operations in Andrews County, TX in August 2011.